Students at PHS are steeped in exploration of the natural world. Unique perspectives, personal connections, and a deep appreciation for the outdoors are traits our program promotes. Through the integration of science, technology, and the arts, we encourage the development of a sense of place and awareness of our responsibility to protect the world we live in. Our close proximity to the Presidio National Park drives our embedded outdoor education program. Stewardship in our younger grades is founded on the idea that kids, before being introduced to larger environmental issues, need to regularly investigate, explore, and discover their surroundings. Students in all grades formally and informally venture into the Presidio National Park. Whether building forts in the redwood forest, digging in sand dunes, or splashing in the creek at El Polin, our students are encouraged to enjoy the wonders and mysteries of these wild urban habitats. A purposeful approach to nature education intentionally cultivates safe, personal relationships with nature. Outdoor play also fosters healthier lifestyles and empathy for living things. Our middle School environmental science program is based on a hands-on outdoor immersion pedagogy. 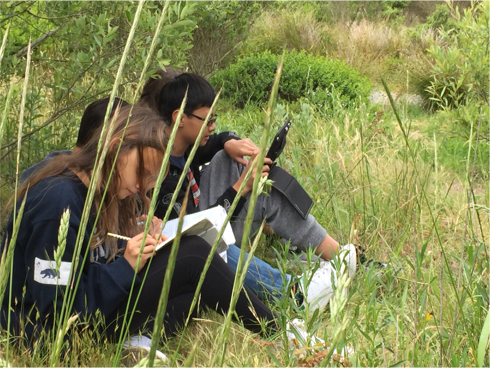 Our living laboratories include 100 year old eucalyptus forests, an intact watershed, wetlands, a freshwater lake, intertidal beaches, native prairies, and countless other wild areas that offer endless teachable moments. Our 1:45-minute field research block classes, allows students to conduct long-term monitoring projects, regularly experience seasonal variances, and helps them more deeply to critically think about and apply complex ecological concepts. First Grade Teacher Natalie's "Forest Friday" program featured in NAIS Magazine!